We have a sort of programme of visiting [the rather large amount of] Scotland which lies north of Ballintuim. So Anna’s visit this weekend was a pretext for a quick visit to Skye – which I haven’t seen since a far off visit as a student. Started in the palindromic village of Glenelg, which isn’t on Skye at all. But the chance of taking the equally palindromic Anna there was too good to miss. We stayed with Catriona, the local Registrar of Marriages. The Glenelg Inn was fascinating – we found ourselves in the middle of a session of traditional music of the very highest standard. And some of the local children seemd quite confident about joining it. I sat there thinking that I must learn to do the traditional fiddle – after I have satisfied my yearning to play the saw. And I thought about how a living tradition is sustained in an all-age community. I could see the commitment of the small number of parents which made that possible. In the morning, we used the ferry across from Glenelg – which starts from the reconstructed Sandaig lighthouse which used to stand near Gavin Maxwell’s house [of Ring of Bright Water and the otters]. Time to chat with two of the happiest people you could meet who run it on behalf of the community. As you can see in the photo, the ferry was also palindromic – having the useful attribute of being able to turn all the passengers round to face in entirely the opposite direction. So I thought about that too. Yes we did go to Skye. The scenery is magnificent but it rained. 6 Responses to Why use the bridge? we note with interest that the converting boat full of happy people has no pews. 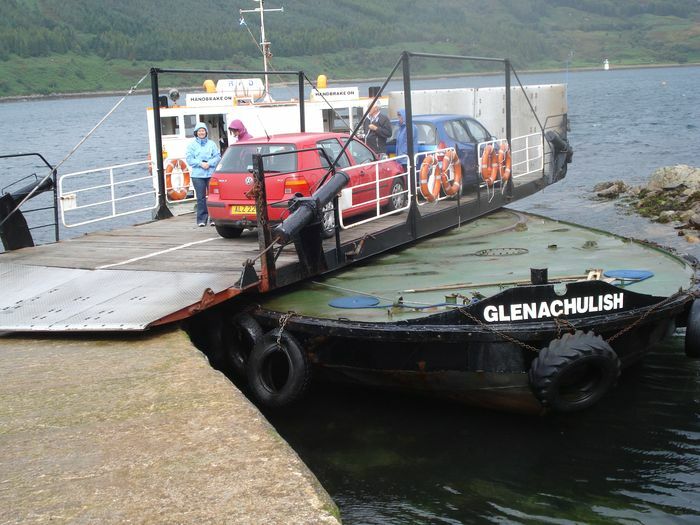 We used the Glenelg ferry when we went to Skye. Hadn’t thought about it being palindromic. The people are obviously palindromic too. Not even any chairs ? Thank you for the photo of the Glenelg ferry; glad to see that the campaign to save it has clearly been successful. It brought back happy memories of walking from there to the gloomy and aptly named Dun Trodden broch; say that in a Scottish accent and you’ll see what I mean. It’s run by the community. They enjoy going to meet with other ferry companies – like P&O and Stena .. and Glenelg. Pity about the weather….we were on Skye over Easter, and the weather was marvellous. Surely not a case of the ‘sun shining on on the….’….no surely not!